On any given day, if you were to wander into our laundry room, you’d find damp clothing hung up, laid out, or somehow exposed to the relatively warm and relatively dry air in there. They tend to dry out perfectly in a day or so, enabling us to just fold them up and take them upstairs without even having spent a single penny on drying. This works particularly well in the winter months, when the air in our home is naturally dry because of the furnace. The air seems to simply wick the moisture out of our clothing, leaving them dry in a surprisingly brief amount of time. 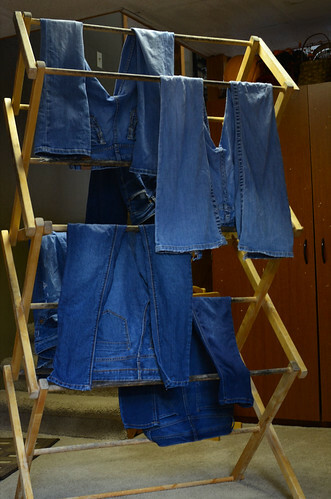 A clothing rack is certainly one option for doing this, as depicted above. You can make a clothing rack out of almost anything that provides really good air flow over most of the item. I’ve seen people use anything from treadmills to garden tools (in a bucket with the handle sticking out) as clothing racks in the past. The most highly efficient way, though, is with a clothes line. Simply stretch a sufficiently strong line or piece of string between two points, grab some clothes pins, and hang up your clothes. It only takes a few minutes to hang them up and take them down and you can fit a lot of clothes onto a single line. You can stretch a line across a spare room in your house. We’ve stretched lines across our guest bedroom and across our laundry room for the purposes of drying clothes. This can be quite convenient as you can just take down the line any time you’re not using it, so you’ll have a clothesline on a typical weeknight, but it can quickly vanish if you’re going to have guests. However, my ideal clothesline is an outdoor one. One of my biggest regrets concerning our current home is that there’s no good place to put a clothesline where it catches adequate air flow without dominating the open space of our yard. A clothesline is one of the first things we intend to install when we eventually buy our house in the country. An outdoor clothesline lets you capture the power of the wind to dry your clothes. The wind billows through, gently drying your clothes and making them smell fresh in a way that a dryer just can’t quite recapture. How much does this actually save? Mr. Electricity reports that if you run 7.5 dryer loads per week and have a $0.15 per kWh rate from your electric company, you’ll save just shy of $200 per year by air-drying your clothes. Given how quickly I can hang up and take down clothes (remember, there’s no loading or unloading of the dryer if you do it this way), it’s worth it for me to do this most of the time. From my experience, dryers are a convenience in time-pinched situations. We tend to use our dryer when we need to get a lot of laundry done quickly (usually in conjunction with rack or line drying) or when we need a specific item dried quickly. It’s a convenient tool, but it’s one where the costs can add up if we use it all the time. Most of the time, we have the spare drying time and the spare space to hang our clothes to air dry, and it takes so little time to actually lay out or hang up the clothes that it’s well worth it. It’s just another small step toward living cheap.